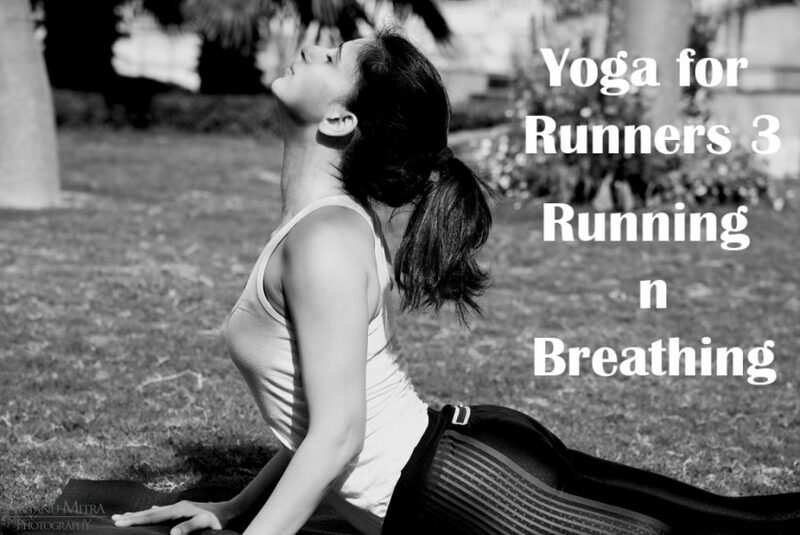 Continuing with the series on Yoga for Runners, this time we worked on something as simple and yet as pivotal as breathing while running! I read (NO, this is not a book review) Running on Air by Budd Coates, a running coach and a four-time Olympic Trials qualifier. He has developed certain breathing patters and ratios for runners. But to really figure out how breathing works for me, I decided to go on a two- week experiment on breathing while running! I ran with my mouth closed, hence breathing through my nose. I decided to run trying out various breathing patterns mentioned by Budd Coates. This happened to me a lot in the first one year of running! And then an experienced friend told me that one of the primary reasons for something like this to happen was that I was out of shape! I was, I had delivered a baby just 10 months back! Various experienced runners advised me build my endurance through strength training. I, of course, always chose Yoga over everything else. I was also advised to keep running consistently and build my endurance side by side. True to the advice, within 3 months of yoga with consistent focus on deep breathing practice and stamina building poses mainly being Surya Namaskars, I was able to normalize my breathing! So, what is the best way of breathing while running? Whatever you do, don’t breath from your chest which is shallow breathing. It can lead to serious hyperventilation and might give a stitch to the runner in the rib area. Deep breathing is important while running because deep breathing means more oxygen to the muscles which helps the endurance and does not let you go out of breathe for a long time, which is what defines our ability to stay longer on the road. Trying breathing ratios didn’t work for me, but I know it works for a lot of people mainly because they religiously practice it to get comfortable with their own breathing pattern. It’s a part of the process of understanding yourself as a runner and becoming a long term runner. Yoga follows the simple practice of breathing rhythm of deep inhales and longer exhales. You could begin by inhaling as long as the count of 3 (inhale as you count 1, 2, and 3) and 3 exhales (exhale as you count 1, 2, and 3). This is called 3:3. Gradually you move to 4 inhales and 6 exhales. And can go on to inhaling at the count of 8 and exhaling as deep and long taking it up to the count of 16. By deep breathing practice, we eventually get to a point where exhalation is longer than inhalation. Through this conscious practice on breathing you can learn to deep breathe. While running it’s difficult to make exhalation longer than inhale but it relaxes you down if you are trying to catch up on breath anytime during or after run. Inhale while you bloat your tummy / deflate your belly as you exhale. The idea is to take in as much oxygen as you can and remove the carbon dioxide. This is how it removes fatigue and helps you stay controlled while running. To practice breathing from your abdomen/belly, lie down and place your right hand on abdomen and left on chest. As you inhale inhale observe your right hand rising and falling at exhale. Left hand is as still as can be. This tells you breath is reaching deep down. Having said, all the above, breathing while running remains a mystery to experienced as well as fledgling runners. What worked for her may not work for him! It may or may not become a second nature for the runner, but practicing breathing for 10 minutes 4-5 times a week has never gone wrong with any runner. Para 4- pl clarify if that is true or wrong statement ie while inhaling Tummy tuck in?? Hi Bhupender. I think it was written by mistake. Have corrected it. When we inhale, we bloat the stomach and when we exhale we deflate it to take out Carbon dioxide from our system. Will practice the same. Keep sharing ! Great dear. Hope it helps you and your fellow runners. So in this article what I have got is 1. Breathing through the stomach and not chest and 2. Exhaling longer than Inhaling and making this In/Ex time longer and longer. Question is how does one do this besides the lying down and breathing . Are there ways to do this in Pranayama. Also is there a role of holding breath in during the practice season that can help? Tension is the athlete s downfall, and breath awareness is key to reducing it. Conscious breathing and Pranayama exercises, which soothe the sympathetic and parasympathetic nervous systems and relax the entire body, can be of great benefit to runners.